A fantastically fun way to get your vegetables. 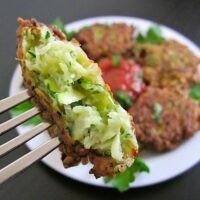 Shredded and seasoned zucchini are briefly fried to make delicious fritters perfect for dipping in marinara. Combine the garlic, oregano, basil, salt and pepper in a bowl (start with 1/4 tsp of salt and about 10 cranks of the pepper mill). Stir to combine. Taste the zucchini and adjust the salt and pepper to your liking. It should be stronger than you want the finished product to be because once you add the flour and egg, the flavor and saltiness will be diluted. Whisk an egg and add it to the zucchini along with 3/4 cups of flour. Stir until everything is evenly combined. The texture should be similar to cake batter. Heat 1/2 cup oil in a small skillet until very hot. To test the temperature, drop a SMALL piece of the batter into the oil, it should bubble heavily. The oil should not be smoking, if it is, lower the heat immediately. Drop the batter into the oil, one spoonful at a time. Fry the fritters on each side until deep golden brown. Let the fritters drain on a paper towel covered plate.